One of Poole’s premier competitive running events with runners of all abilities, from top local athletes to runners competing in their first 10k race. The course was changed in 2018 to a new single lap route taking in Poole Quay and parts of old Poole, while still including the wonderful views from the harbourside parks. Minimum age is 16 on day of race. 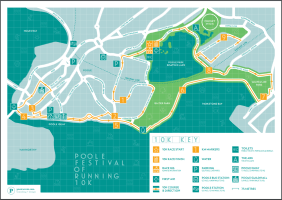 The Poole 10k is a flat course, run on closed roads and harbourside paths. The route is fully marshalled and is suitable for all abilities of runner.